This is probably the most common harmonic mixing transition – corresponding to one counter-clockwise rotation on the circle of fifths. In this case, the first track is in Bb minor phrygian, and the second track is Eb minor phrygian. So the root key has shifted up by 5 semitones. I call this a parallel interval because, due to the modes being the same, all notes are transposed an equal amount. Most harmonic mixing tools don’t actually differentiate between the different minor/major modes (instead only detecting major or minor and the root), so a parallel interval is a bit more specific. The transition starts at 6:10. 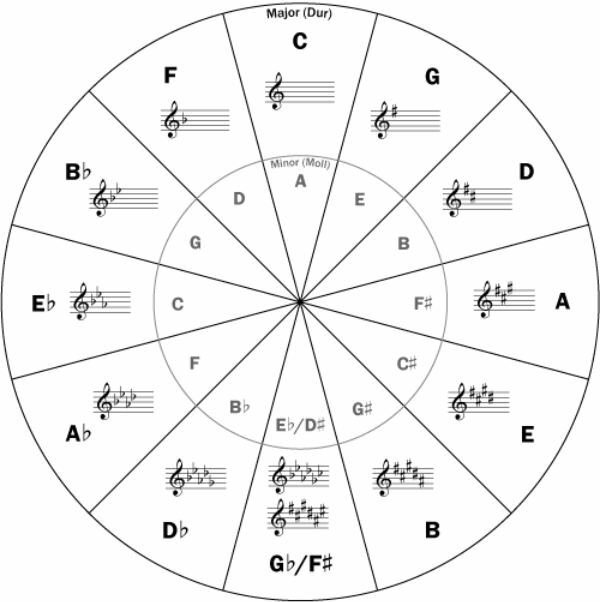 There’s a concept in musical set theory called complement, where the set of notes is given as the set of all notes which are not included in the original set. Applied to a musical mode, there may be multiple complements. In this case, I’ve chosen the complement whose root is a tritonic interval (6 semitones) from the original note. Specifically, the mode of the first track is A minor dorian and the mode of the second track is Eb Major Mixolydian. This transition begins at 4:36, pivots at 5:34, and completes at 6:04. Try to pay attention to the notes involved, most prominent being the tritonal interval between roots. I’ll be uploading more examples of various mode transitions, cause it’s neat IMO. You know how you can browse tracks on sites like Beatport.com, and you get to preview a portion of the track? Well, those previews are just MP3 files that are split from the full tracks. Each preview is usually about 2 minutes, and you can get the URLs for an entire genre via RSS feeds. So, you can use the Firefox plugin “FlashGot” to automatically download all of the MP3 files that are referenced in the “Top 100” House music RSS feed on Beatport. Then, you can run them through key detection software to get musical key info on them all. It’s a lot of work to keep the mix going, since the samples are so small. I’ve been pretty much warping the tracks in real time, figuring out where the phrases are, getting them sync’d up, and timing the drops. There’s a lot of room for error if you lose concentration, or if you just happen to get a track that doesn’t line up quite right. So having an emergency fallback to save the mix in these bad scenarios would be good..
It’s an interesting technique, for one because it’s free to get these track samples. That saves a lot of money, considering each track is normally either 1.99$ or 2.49$.. — also, the speed of mixing is a lot faster, so it really helps you develop your mixing skills, and forces you to learn recovery techniques. Probably more on this technique in the future! What happens if you take a loop, pitch bend it down to half tempo, while mixing in a new loop at full speed? How about if you combine that with some Ableton pitch-sustaining tempo manipulation? Listen for yourself! Here’s another experiment, this one with pitch/tempo manipulation up and down. Halfway through creates a pretty cool effect. I’m sure some other digital DJ has thought to use this technique. I’ll see if I can work it into the next APU mix. For anybody interested in technical details … I utilized something called Harmonic Mixing a lot in this mix. Basically that means taking the musical key of each track into consideration when creating transitions and selecting loops. Just like combining different keys on a piano will make different chords, combining loops in a similar fashion makes for a much more coherent mix. I’m really just scratching the surface of harmonic mixing, but the results in my mind are pretty clearly an improvement. When mixing without regard for musical key, instruments tend to clash in subtle ways. Being conscious of the keys of your tracks, and choosing them carefully, is a very valuable heuristic for making a smoother mix. As I am becoming more and more comfortable with my new Xone:3D hardware, I am learning a variety of fun tricks. The hallmark of a great DJ is the ability to take a track and make it his (or hers). A technique that really piqued my interest, at a recent rave (EDC), is the layering of the same track twice, offset by a few beats or bars. John “00” Flemming completely blew me away with a set at EDC 2007 using this technique. He was playing some great psyc-trance rhythms with delicious dirty bass, and using the multi-track technique to tease on each drop. I have been recently experimenting with similar techniques. Here is a recording of this type of technique that I made using Ableton Live and my Xone:3D. The first dramatic drop is done by duplicating the track, offset, applying a High Pass Filter (HPF) to the currently playing track, along with a “ping-pong” Ableton filter, and then sliding in the 2nd track when the bass drops. The result is a climax which leaves behind some mids and highs which are then manipulated as the track progresses. Later in this example, the two tracks are faded in and out, which is another funky effect. The sloshing highs through the middle of this example, before the track fading, is not part of the source track and is done using only the HPF on the remainder of the HPF+ping-pong effect.